What are you thinking about right now? What were you mulling over five minutes ago? Before that it was something different, right? So are you thinking about what is actually happening right now or in the back of your mind are you pondering something that has already happened or perhaps stressing about something that may or may not happen in the future? We spend much of our time thinking about painful things in the past or fears for the future and that is a root cause of anxiety and stress. 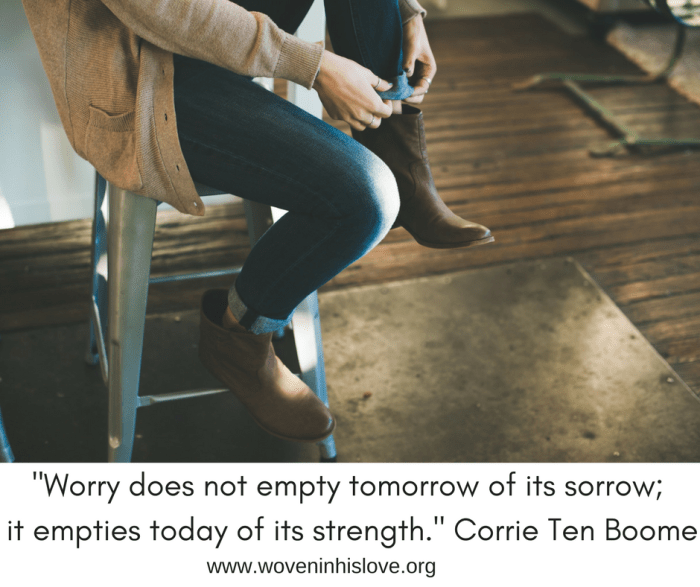 Worry about what came before and what may be looming ahead keep us stuck in painful cycles where we search for solutions for problems that we can’t solve while neglecting what is right before us at this present moment. A study called “A Wandering Mind is an Unhappy Mind” done in 2010 by Matthew A. Killingsworth and Daniel T. Gilbert at Harvard University concluded that most people spend more than half of their time thinking about things that are in the past or may happen in the future instead of what’s happening right now. Their study showed that happiness is found by being present in the actual moment- even if that moment is spent washing dishes! In his book, Truly Human, author Kevin Sherer explains that we do this as a coping mechanism- a way to attempt to soothe our anxieties and fears because our minds are natural problem solvers. We rehearse painful events from our past, looking for ways it could have gone better. We stress about events in the future, worrying about days that haven’t happened yet and trauma that only exists in our imaginations. Worry doesn’t make our future easier to handle- it increases the magnitude of stress by taking away the joy of this moment. We might also put off happiness because tomorrow is going to be so much better. Maybe it will be better, but today is the moment that your life touches eternity. Elder Thaddeus of Vitovnica’s book, Our Thoughts Determine Our Lives, supports the idea that a wandering mind is a stressed mind. He describes a wandering mind as a whirlpool of thoughts. Taking every thought captive, as Saint Paul writes in 2 Corinthians 10:5, and centering those thoughts on the present, brings order and peace back to our minds. By focusing on right now, we open our minds up to Christ’s presence with us in each moment. Calm yourself by breathing deeply and slowly. Drop anchor mentally by praying a simple prayer and letting yourself focus on the present moment. Take care of your body. Is it anger or ‘hanger’? Do something for someone else to take your mind off yourself. Take care of your present responsibilities. Walk the dog, do the dishes, do what needs to be done and be present while you do it. These strategies help us to be watchful. Stressful, wandering thoughts will come to us anyway, but over time we can develop increasing control, or watchfulness, over which thoughts nest in our heads. Be watchful and guard your heart and mind against those painful scenarios of the past which magnify the original pain as we relive them, and the agonizing fears of a future that probably won’t ever happen anyway but still leave us traumatized. The present moment is enough, and Christ meets us here, in this moment. Our memories can magnify and distort our painful memories, causing us to suffer over and over again as we recall past events that were harmful to us. These memories make it harder for us to hold on to hope for the future. Call your mind back to this moment, to the real things in this moment, because that is enough for you to deal with. Pray for God’s help in your true daily struggles and let the whirlwind of past and feared stresses become a calm sweet breeze.